Written by SCOTT SNYDER Art by GREG CAPULLO and JONATHAN GLAPION Cover by GREG CAPULLO 1:25 Variant cover by IVAN REIS and JOE PRADO 1:200 B&W Variant cover by GREG CAPULLO As Bruce digs deeper into the mystery of the recent owl murders, he soon finds himself face to face with a shocking enemy - an enemy the Wayne family has secretly been at war with for centuries. Be there for the first shots of the war for the soul of Gotham City. 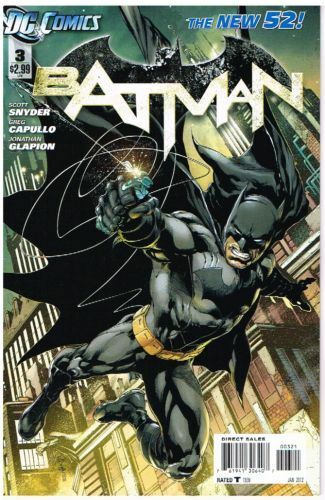 Friends will become deadly enemies and secrets will be revealed - revelations that will change the Bat-family forever.